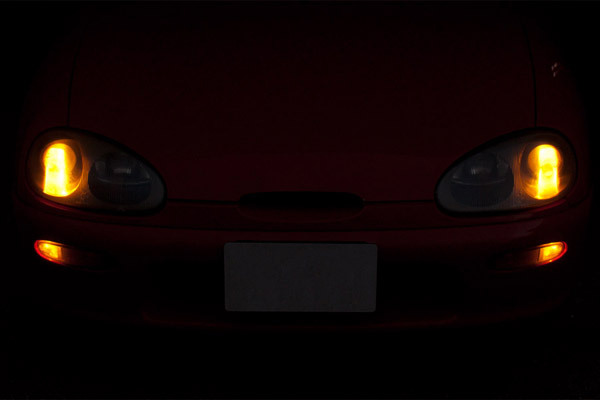 The overhaul of the lighting on the Cappuccino began with the decision to replace the rather feeble main beams with a cheap Chinese-built HID kit – by choosing to run “golden yellow” 3000k bulbs I effectively made it necessary to swap out the standard H3s (and, as it would turn out, the W5W sidelights too) for matching yellow items. Replacement of both the H3 and W5W bulbs is very straightforward, especially when compared to the difficulty of getting at the H1s! Originally I didn’t envisage swapping out the W5Ws for yellower versions but the difference between the yellow dipped beams and the whiter sidelights is very noticeable (although very hard to show on camera) so they also had to be changed. It’s also worth highlighting that the “yellow” LED W5W replacements you can find on eBay are almost invariably amber (i.e. 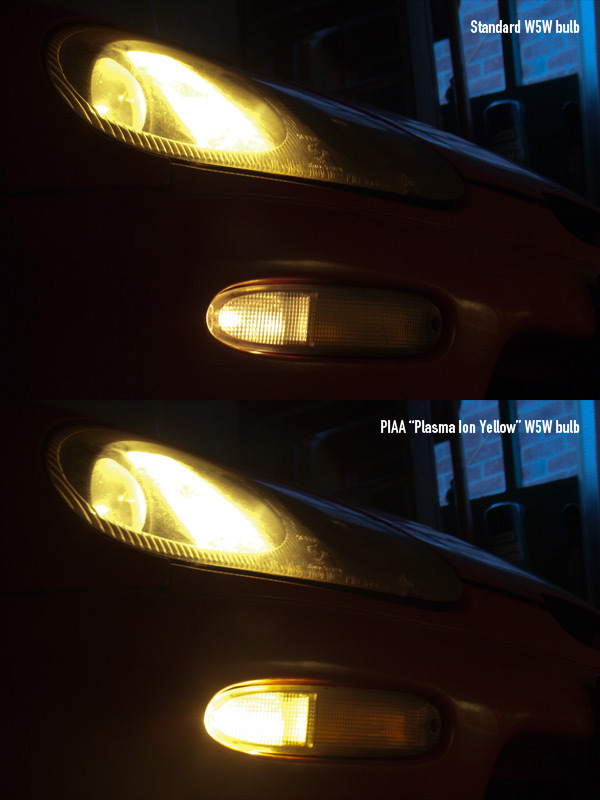 useful for your side repeaters and nothing more) and for my own conversion I ended up buying PIAA “Plasma Ion Yellow” bulbs from the USA (also via eBay). To replace the H3s it’s simply a case of peeling back the front wheel arch liners to reveal the back of the lamp unit and the twist-off H3 cap – depending on how much space you like to work in you can either remove the front wheels or, as I did, jack the car up slightly to drop the wheels and give you enough clearance. To replace the W5W sidelight bulbs unscrew the single fixing on the front of the sidelight/indicator housing, being careful as the screw is in the perfect place to gather rust both on the head and on the tip (inside the bumper).